We Are Chester writer Tori Erskine heads to The Dolphin Inn hotel in Mold to sample a piece of immersive theatre based on her favourite book – The Great Gatsby. It has been brought to Mold by Theatr Clwyd in a co-production with The Guild of Misrule. Photos: Tori Erskine and Sam Taylor. As soon as I heard that The Great Gatsby was coming to Theatr Clwyd immediately I thought ‘Where do I sign up?’. It’s the one book I’ve read about a billion times, not to mention writing my dissertation on it, so no pressure Theatr Clwyd. There’s always that niggle of worry when your favourite book is brought to life, will they portray the characters right? Will they stick to the storyline? However, when I walk into a 1920s Speakeasy at The Dolphin Inn hotel in Mold, all my fears quickly subside. Immediately you are immersed into the story as you enter the seedy underbelly speakeasy of 20s New York. As we all stand around and chat to have a drink the bar staff continue to set the scene in their accents, costumes and asking us how far we had travelled across the city that evening. I feel like I have been transported back in time. I don’t want to get my phone out and take any photos just because my iPhone will be such a big anachronism in the moment and I want to stay authentic to the period. As we’re all stood round in the bar area, a gentleman starts talking who instantly grabs our attention. It’s Nick Carroway (Michael Lambourne), the story’s narrator. If you know the story you’ll notice that Nick in the play is a lot more sociable and outgoing than the reserved character originally painted by Fitzgerald. After Nick introduces himself we’re all told to follow him. Are we going to our theatre seats? No! We’re walking into a glamorous party. Even though my iPhone is in my pocket and I am in my modern day clothes (by the way you need to dress up!) I felt like I had been transported back in time as the jazz music and bright flappers outfits surround us. Even my other half is pulled into the centre of the scene to dance. “This (production) hopefully gives people a moment of escapism where they can go ‘I can be someone else and exist in a world where nothing is expected of me’,” Michael tells us. This performance doesn’t just break the fourth wall, it smashes it, and brings with it an innovative way of presenting a classic and timeless novel. 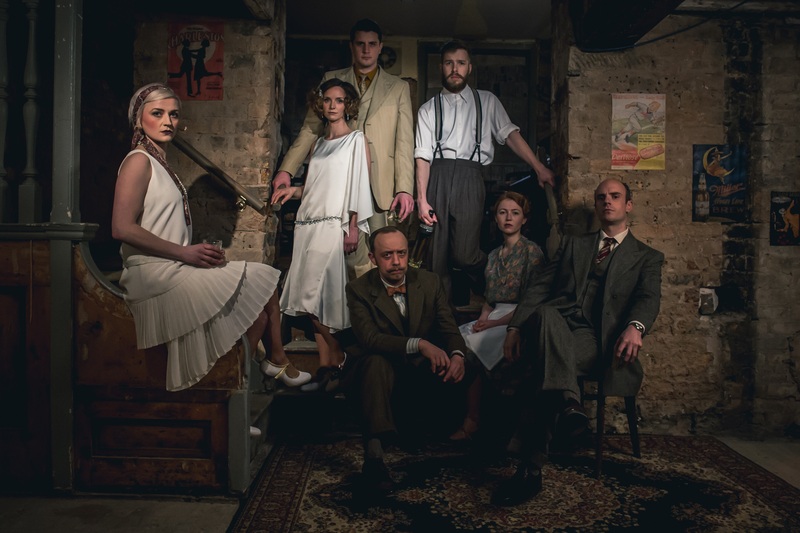 The Great Gatsby certainly is a great example of how immersive theatre shows that modern day theatre doesn’t need to be tied down just to a stereotypical seated production. This performance doesn’t just break the fourth wall, it smashes it, and brings with it an innovative way of presenting a classic and timeless novel. This is undeniably the most unique play that I have ever been to. I love the atmosphere as different scenes go on at once, completely submerging you into the story. You feel like you bond with the characters as Gatsby (Oliver Towse) takes us to a private meeting to share his business deals and Jordan Baker (Zoe Hakin) pulls us away for a gossip about the characters in the tale. For anyone who has read The Great Gatsby they will know that the story is very dramatic, a true tale of romance and tragedy, and all of the emotions that come with these the cast convey superbly. From Daisy (Amie Burns Walker) and Gatsby’s intimate reunion, to Myrtle’s (Bethan Rose Young) tragic death scene, and the heated moments between Tom (Jake Ferretti) and George Wilson (Matthew Churcher) after her death. Whilst the play delves into serious issues and traumatic scenes, the cast still maintain the nonchalant fun elements of the era that are echoed in the story and do so with perfect comedic timing. If you’re going to see it, be sure to get involved, Matthew Churcher tells We Are Chester: “The audience genuinely make it!” I was so intrigued to learn from the cast that the play is first rehearsed in one room before heading over to The Dolphin Pub. It is no wonder that the show has literally sold out so quickly. It is so good we have booked to go back and watch it again. I can safely say that the cast’s fantastic efforts and the script of the play definitely don’t taint the original text for me, but have instead inspired me to read The Great Gatsby for the billionth and one time. We awarded ⭐ ⭐ ⭐ ⭐ ⭐ to The Great Gatsby. The Great Gatsby is a co-production between Theatr Clwyd and The Guild of Misrule.